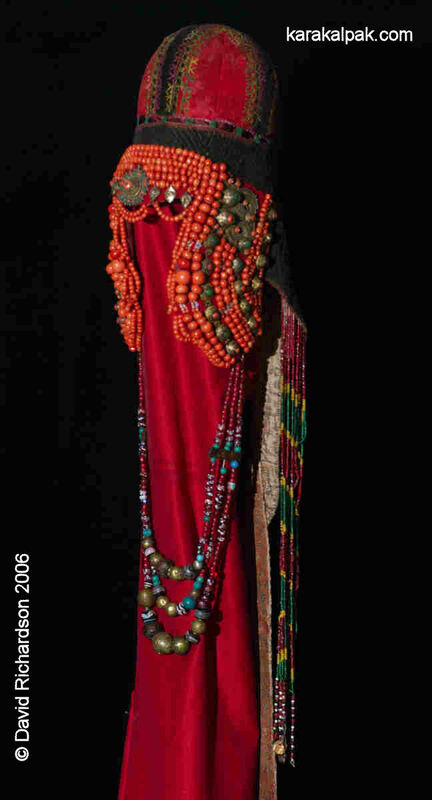 The Karakalpak sa'wkele is an elaborate ceremonial headdress embellished with corals and semi-precious stones, once worn by the daughters of the wealthy tribal aristocracy during their marriage ceremonies in the 19th century. Their use died out in the early part of the 20th century. Today sa'wkeles are extremely rare and no more than seven exist in the museums of No'kis and Saint Petersburg. The sa'wkele is associated with the even rarer crown-like to'belik, a cylindrical metallic headdress, gilded and encrusted with jewels. In some cases this may have fitted over the cap of the sa'wkele for additional embellishment. In other situations it may have been worn on its own by betrothed girls prior to the completion of their wedding. Sa'wkeles seem to have been principally used by the Qon'ırat Karakalpaks living in the coastal region of the Aral Sea and the northern part of its delta. Their use was particularly strong in the small central region to the north of the Qusxanataw elevation, stretching from the banks of the Amu Darya between Zayır and Porlıtaw (Medeli) eastwards to the region of the former sovxoz named "Karakalpak" just south of Aq Qala, and northwards to the islands along the southern coast of the Aral Sea. The sa'wkele and to'belik represented the pinnacle of the Karakalpak jeweller's and engraver's art. Karakalpak jewellers were called zerger, or zergerami a Turkic word derived from the Persian zar for gold. It was a very conservative male craft, governed by its own regulations or risa'le and based on the ustasha'kirt, or master-apprentice system in which sons were taught by their fathers. An apprentice could only qualify as a zerger with the approval of his pir (a special spirit which protected a group of craftsmen) or teacher following many years of work mastering the established traditions of his craft. In the 19th century almost every major village had its own jeweller although the main centres of Karakalpak jewellery manufacture were in Shımbay, Qon'ırat, Xalqabad, and Xojeli. Although some jewellers gained wealth from their profession, it was one that carried very little social status. 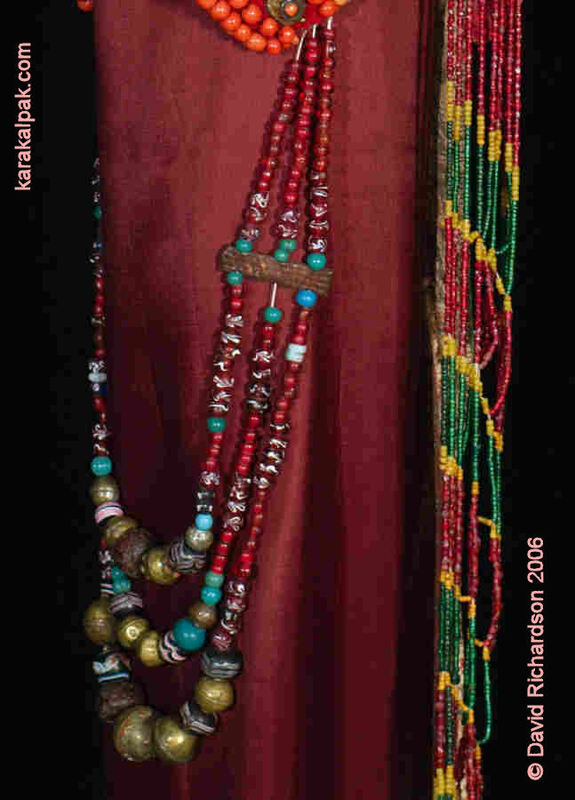 The Karakalpak sa'wkele, showing necklaces and pendants. The Karakalpak (and Qazaq) spelling of the name for this headdress is сәўкеле (,em>sa'wkele,/em>, while the Russian is саукеле. Consequently Russian academics refer to the saukele. M. S. Andreev argued that the word sa'wkele has a compound formation and is not Turkic but of ancient Iranian origin, formed from the word for king, shah, and for hat or head, kuloh or kelle. He claimed that in a Turkic Qipchaq language such as Karakalpak or Qazaq this changed phonetically into shevkele or sa'wkele, depending on whether it was pronounced with a "sh" or an "s". The word kulokh has been used across Central Asia in relation to both male and female headwear since the Middle Ages. Alternative interpretations are based on the word sa'w, which in Turkic can mean health and happiness and in Qazaq can mean solar or beautiful. In Karakalpak the word sa'wle means ray, beam, or glow. There is no scientific evidence to indicate the true etymology of the word. a plait cover or halaqa, consisting of different upper and lower parts. The tumaq is made of felt and is covered on the outside with woollen felted cloth, or ushıga, apparently glued into position. A black cross made from qara ushıga is centred on the apex of the tumaq with its arms oriented from the very front to the very back and from side edge to side edge, the quadrants in between being filled in with qızıl ushıga. The edges of both the qara and the qızıl ushıga are decorated with small repetitive embroidery motifs using coloured silk and a simple loop-stitch. The tumaq is lined with dyed cotton bo'z. Black netting is attached to the lower edge of the tumaq, this being short in length at the front of the headdress and long at the back. The netting supports closely packed rows of pink coral beads, some oriented horizontally across the forehead, others oriented vertically over the ears and cheeks. The beads are supported on a backing of red dyed cotton bo'z. The coral beads across the forehead terminate at the bottom with a row of small metal decorations, in the centre of which is a prominent gilded and bejewelled round metal plate with coral and turquoise insets. The latter is known in some regions as a jıg'a, meaning circle, and in others as a qa'teb, meaning a connector. The rows of coral forming the earflaps are interspersed with a few rows of gilded settings holding more coral and turquoise stones. 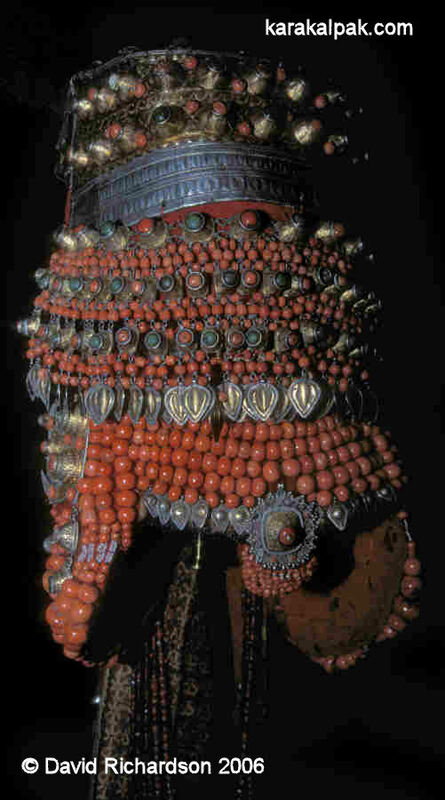 The most prominent decorations are a pair of matching metal plates, also set with stones and decorated with filigree, positioned in the upper middle part of each earguard. They are known as qıran. Some say this means dextrous, adroit, quick, tenacious, or sharp-sighted, while others say it means vigilant or mortal grip. They are supposedly shaped in the form of an eagle or bird of prey attacking a horned mountain goat and have been claimed to be an ancient remnant of the Scythian "animal style" of decoration. In fact the Karakalpak word for a hawk is qırg'ıy. Bronze settings were normally engraved by hand and then gilded with a small amount of gold or silver alloyed with either mercury or lead. and the qıran, right, with an eagle attacking a mountain goat. The paddle-shaped halaqa plait cover is attached to the back of the tumaq by its upper edge. This is made of qara ushıga with a qızıl ushıga outer border. It is decorated with simple embroidered motifs using silk threads and is lined with block-printed cotton bo'z. The word halaqa normally refers to the loose ends of a turban that hang down the back. It is made from four long and narrow strips of asmyie embroidery arranged in parallel and sewn together side by side except towards the very bottom, where they are allowed to separate like a feathered tail. Indeed it is frequently compared to a folded peacock's tail. The strips are decorated with floral patterns executed in basma technique in which coloured silk threads are couched at right angles to produce a ribbed effect, frequently seen in Uzbek suzanis. The halaqa, with an upper plait cover of ushıga and a lower "peacock's tail" of Bukharan basma technique. Strings of small beads hang down from the rear of the black netting, on either side of the halaqa. These are arranged in coloured sections of red (the same shade as pomegranate seeds), green, and yellow and in places are linked horizontally so that they hang together as one. The boydası necklace and the rear pendant of beads. A more prominent cluster, composed of three separate strings of beads of increasing length, is attached to the bottom of each earguard. It is intended to hang like a necklace across the breast. These strings are called boydası - a boyda being a rope for tying a camel. The beads vary in nature and size, with small pomegranate-coloured beads, decorated glass beads, beads of paste and of turquoise stone, a few beads of resin, and some larger beads of hollow bronze. It is likely that the earliest dyed woollen broadcloth was imported into Khorezm from England. We know that Anthony Jenkinson sold a small number of woollen kersies during his visit to Urgench in 1558, some 40 years before the first historical mention of the Karakalpaks at Sighnaq on the middle Syr Darya. A kersie was a woollen cloth made in the village of Kersey, close to Sudbury in Suffolk. In the early 19th century, long before the development of a mechanized Russian weaving industry, the market for woollen textiles was dominated by English mills. One of their finest products was woollen broadcloth, dyed with domestic madder or cochineal imported from the Canary Islands. Produced by the non-stop hammering of woollen cloth in fulling stocks powered by waterwheels and then sheared, it was superior to anything that could be made by hand. We know that huge quantities of broadcloth from mills at Stroud in Gloucester were exported to Russia, Persia, and India and some of this probably found its way into Central Asia, especially from India via Kabul, but also through traders in Orenburg and Meshed. 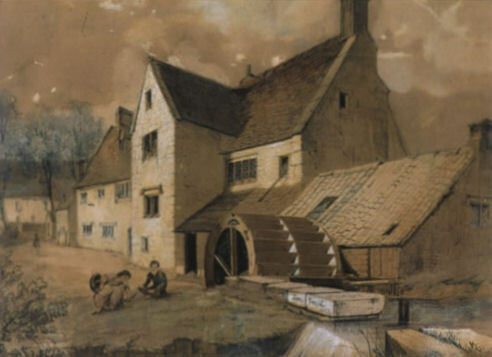 Watercolour of an English woollen mill at Chalford near Stroud in Gloucestershire. As the 19th century progressed private Russian companies increasingly industrialized. The best textile machinery at that time was made in England, but for protectionist reasons its export was proscribed until 1842. From the 1840s onwards the number of Russian textile mills expanded rapidly, many spinning, weaving, and printing cotton but a smaller number weaving and fulling wool to make broadcloth or sukno, although this was of inferior quality to English cloth. Not only English machinery but also English managers and technicians were brought to Moscow to equip the new factories and to train their employees. Russian manufactures were imported into Khorezm by regular caravans, numbering from one to two thousand camels, operating out of Orenburg and Astrakhan, usually travelling via the Syr Darya. However when James Abbott visited Khiva in 1839 it was a time of increased hostility between Russia and Khiva so goods had to be imported via Bukhara. He noted that articles imported from Orenburg and Astrakhan at that time included both broadcloth and cotton cloth. Vambery gives figures provided by the British Embassy in Saint Petersburg indicating that some £26,000 of Russian woollen manufactures were imported into Khiva between 1840 and 1850. Imports of woollen goods jumped fourfold between the 1850s and the 1860s but varied significantly from year to year. During the 1860s quantities were generally minimal but exceeded 80,000 roubles in the two years of 1865 and 1866. Even so Russian merchants and manufacturers remained concerned about the increasing penetration of English goods from Persia and Afghanistan. In 1850 the manufacturer Pichugin wrote to the Russian authorities noting that England would soon outstrip Russia in its trade with Central Asia and was engaging in Bukhara and Khiva in order to shield its Indian possessions from Russia. In 1869 the Orenburg authorities barred the import of European goods, giving Russian producers exclusive access to the markets of Turkestan. Sample of 20th century Russian qızıl ushıga, known in Russia as sukno. Following the Russian conquest of Khiva in 1873 Russian merchants established trading stations in New Urgench and imports from Russia began to become more regular. Spalding noted that cloth and cotton prints remained the chief articles of import from Russia in 1874. The completion of the Transcaspian railway in the 1890s meant that goods could now arrive from Russia via Chardzou or by ferry from Aralsk. Imports of Russian sukno amounted to 15,000 roubles in 1894 and 17,600 roubles in 1899. 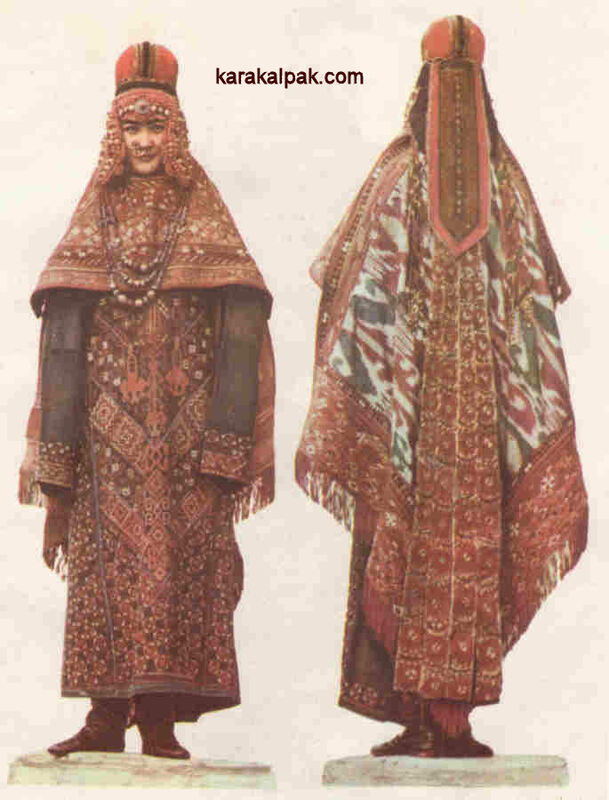 Between 1907 and 1912 textiles accounted for 35 to 40% of the value of all Russian imports into Khiva. 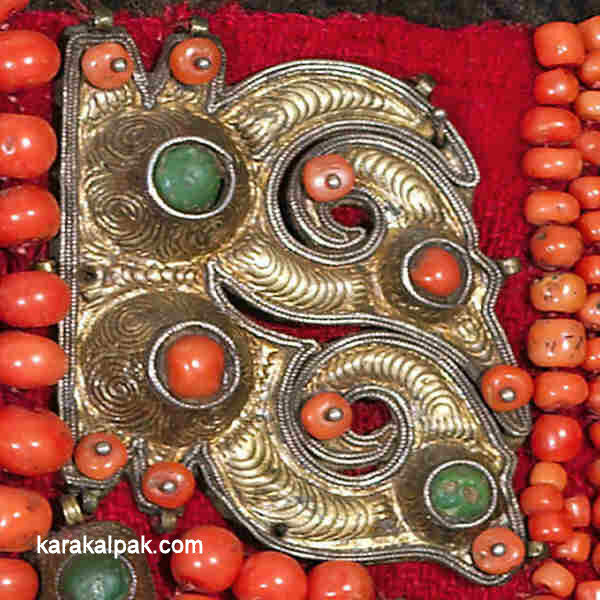 Karakalpaks regarded ushıga as a prestigious textile, which for them was extremely expensive. As a result of days of machine hammering the surface of broadcloth is closely felted, concealing the weave. Cutting produces a smooth and even finish, quite unlike any handwoven textile and ideally suited for embroidering. Whereas coarse bo'z was suited for geometric cross-stitch embroidery, broadcloth was perfect for chain-stitch. Its increasing availability from the 19th to the 20th century led to a change in Karakalpak fashion, with chain-stitch embroidery becoming ever more popular. One of the mysteries surrounding the Karakalpak sa'wkele concerns the large amount of coral (marjan in Karakalpak) used in its manufacture. Coral was and still is regarded as a talisman in many cultures with the power to ward off evil spirits and the malignant effects of the evil eye. It is associated with the planet Mars. 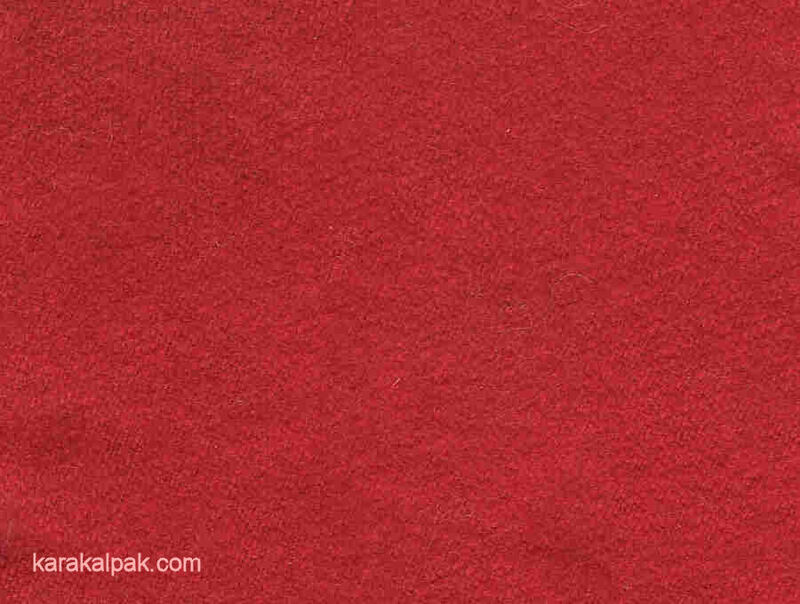 Coral is an organic material formed in a wide range of shades and hues from red and white and blue to brown and black. Most coveted are the red shades, ranging from the palest petal pink through salmon to deep velvety red. Corals are not delicate but with a hardness of only 3.5 they are considerably softer than any other gemstone material. 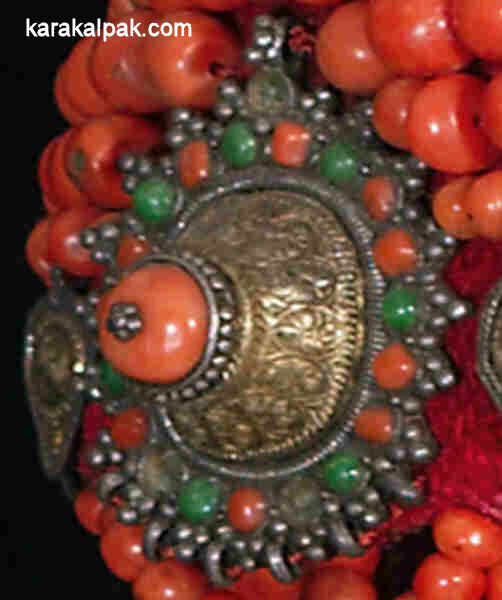 Coral and turquoise beads on the ear cover of a Karakalpak sa'wkele. Coral is foreign to Central Asia and must have been imported from the Mediterranean, India, or China, Mediterranean coral being the most sought after. In the Mediterranean coral is found along the coasts of Algeria and Tunisia, in Spain, France, Corsica, Sardinia, and Sicily, and in Turkey and the Red Sea. The Persian Hudûd al-Âlam, written in 982, recorded that there was no place like Tabarqa in the Maghreb for coral, with its offshore coastal coral banks, although it was also imported from Hindustan. In 1222 the Chinese delegation accompanying the Taoist monk K'iu Ch'ang Ch'un purchased fifty coral branches from Mongol soldiers who were returning from "the Muslim territories" to Mongolia. The Chinese were travelling back to Samarkand from a meeting with Chinggis Khan in the foothills of the Hindu Kush. Marco Polo found that coral was especially highly valued in land-locked Kashmir. Coral also occurs in the coastal waters of India and Sri Lanka, China, and Malaysia. When Ole Oulfsen was in Bukhara in the late 19th century he found that coral or mardyan was greatly valued for female adornment. It was brought overland from China and "magnificent specimens both in white and in red" could be found on all the bazaars. Local turquoise deposits occur in the Sultan Uvays Dag range of southern Karakalpakia, in the Nurata Mountains and in rock outcrops in the Qizil Qum. However some of the highest quality turquoise was imported into Central Asia from mines located around Nishapur in the Persian province of Khurasan. Khurasan was noted for its turquoise in the Hudûd al-Âlam, and Clavijo reported that they were also found in the bed of the river close to Nishapur. Marco Polo also referred to turquoise from the mountains of Kerman. Babur had heard that turquoise mines were located in the mountains close to Khodjent, while Shuyler noted that inferior turquoise was found in the mountains close to nearby Kokand. Turquoise has a tendency to turn green over time and then to be mistaken for other stones. 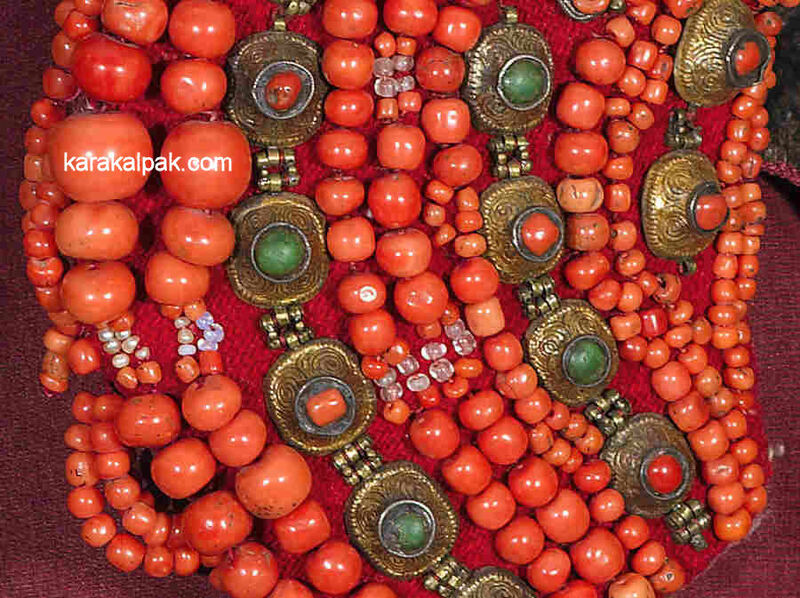 Carnelian is used in the Karakalpak to'belik and in Qazaq sa'wkeles. It is a form of cryptocrystalline quartz. It is not found in Karakalpakia but is mined in neighbouring Uzbekistan and northern Afghanistan. There are also smaller local deposits in the Bushehr peninsula of Persia and in the Helmand province of Afghanistan. One of the major sources of carnelian was from the region of Broach in Gujarat. Islamic merchants shipped it into the Persian Gulf and then brought it overland to Central Asia. It also occurs in Arabia and Egypt. There is no Karakalpak tradition of floral embroidery using the basma embroidery technique. Asmyie is a type of traditional decorative embroidery that was imported from Bukhara. It has a resemblance to 18th century Ottoman embroidery and to certain 19th century Uzbek suzanis. A sample of Bukharan asmyie. In her study of 19th century Bukhara, Olga Sukhareva described the various craft districts of the city, known as guzars. Guzar number 159 was known as the "alaqa-bandon" district, and was probably the location of workshops for the production of alaqa. They were used by wealthy female Bukharan Uzbeks as plait covers, and some can be found today in museum collections (see for example page 286 in Johannes Kalter and Margareta Pavaloi, Uzbekistan, Heirs to the Silk Road, Thames and Hudson, London, 1997). firstly it conveyed her high status to the wedding guests. secondly it concealed the bride's hair at the time of marriage, a ritual originating from the ancient pagan belief that a woman's hair provides a conduit for evil forces to enter her body and mind with the intention of damaging her, her fertility, and in the future her unborn child. Although a single girl was free to expose her hair she had to completely cover her hair from the moment of marriage onwards. finally it provided amuletic powers of protection. The colour red and semi-precious stones such as coral and turquoise were regarded as a defence against the evil eye and harmful diseases, as were the resin beads incorporated in the boydası. Carnelian on the other hand was regarded as a symbol of prosperity and happiness. Sadly there is not a single historical record describing the part that the sa'wkele and to'belik played in the aristocratic Karakalpak marriage ceremony. All we have is anecdotal information gathered from elderly people, some of which has been published by Tatyana Zhdanko and some of which has been independently reported by Nina Lobacheva and Xojamet Esbergenov who were both junior members of Zhdanko's team. Not surprisingly the results are varied and not entirely consistent. When Russian ethnographers from the Khorezm Expedition came to the Aral Delta immediately after the Great Patriotic War they could not locate a single example of a sa'wkele. They had to refer to examples in the Museum of the Peoples of the USSR in Moscow and the Regional Studies Museum in No'kis. In 1947 members of Zhdanko's team interviewed elderly women and showed them drawings of a sa'wkele. Many recognized the headdress and were able to name its parts and decoration. For example a 62-year-old woman named Sarıbiyke from the "Kizi-tu" kolxoz near Kegeyli was able to identify two of the jewelled elements as the jıg'a and the qıran. However she noted that the drawing was incomplete because the sa'wkele was always worn with a metal to'belik, the latter being placed over the tumaq like a crown. On the other hand interviews conducted in the city of Qon'ırat and the village of Qazaqdarya and reported by Esbergenov identified other people who had actually seen the sa'wkele in use and claimed that the to'belik was worn by girls, while the sa'wkele was worn by married women. Later work conducted in 1956 identified different elderly people who believed that the sa'wkele was worn in combination with the to'belik. Karakalpak sa'wkele crowned with the to'belik. Image courtesy of the Treasury of the Russian State Hermitage Museum, Saint Petersburg. Ethnographers from the Khorezm Expedition also studied the clothing of the Uzbeks who lived in the Aral delta during the period 1946-1948. 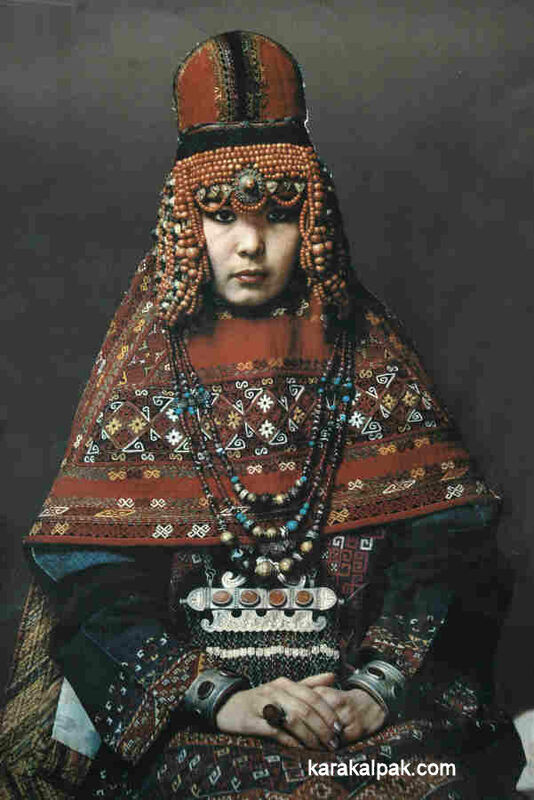 Elderly Uzbek women confirmed that in the old times they too, just like the Karakalpaks and Qazaqs, had the sa'wkele and the to'belik-like kasava headdress, although by then they were no longer in use. Nina Lobacheva has summarized some of the responses from Karakalpak people who claimed that the sa'wkele was worn above the kiymeshek. In Shımbay region it was claimed that the kiymeshek was worn below both the sa'wkele and the to'belik. In Kegeyli region they noted that the sa'wkele and the kiymeshek were put on for the first time during the day when they transported the bride into the house of her fiancé. However, in 1956 one of the Kegeyli informants who was born in 1900 described this in more detail. She remembered that women still wore the sa'wkele during holiday festivities when she was 15 to 16 years old, in other words around 1915 to 1916. Sa'wkeles were reserved for the daughters of the rich and were financed by their fathers. The bride was first dressed in the kiymeshek and sa'wkele on the day of the wedding, after she had been brought into the house of her fiancé. Karakalpak model wearing a sa'wkele with a qızıl kiymeshek and a ko'k ko'ylek. In fact the chain-stitch qızıl kiymeshek came into fashion after the sa'wkele had fallen into disuse. 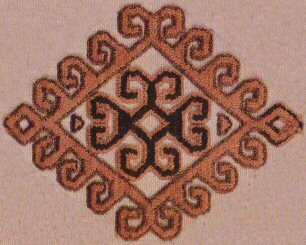 From a plate in Allamuratov's "Karakalpak Embroidery". In the Qarao'zek region however the sa'wkele was first put on after the bride had descended from her arba near the house of her fiancé. In the Qonırat region they reported that the bride was dressed in the sa'wkele by her tutor or jen'ge (the wife of an elder brother or uncle) at her own home on the day of the wedding after she was placed in her arba to travel to the house of her fiancé. She wore a kiymeshek under the sa'wkele but not a to'belik. The bride wore the sa'wkele after her wedding for holidays and feasts. In Taxta Ko'pir region they claimed that it was not necessary to wear a kiymeshek under the sa'wkele at all. Mu'yten-Ken'tanaw people from Tasbesqum Island confirmed that they tied a small headscarf under the sa'wkele and then tied a turban-shaped silk scarf or tu'rme above it, covering the entire head. Mu'yten-Teli people from Qaraboylı Island and Qıyat-Ashamaylı from Moynaq said that the tu'rme was wound lopsidedly so that the sa'wkele was mainly visible from the right side, only the metallic platelets lining the forehead being visible from the front. Lobacheva realized that by the middle of the 20th century elderly people had forgotten a great deal about their traditional customs. She came to the conclusion that on the day of the wedding party the bride was dressed in the sa'wkele in her own house by a woman from her side of the family and was dressed in the kiymeshek in the house of her fiancé by a woman appointed from his side of the family, known as the bride's proxy mother or murındıq ene. At the beginning of the 20th century the trousseau of an aristocratic bride consisted of a small headscarf, a kiymeshek, the sa'wkele, a tu'rme, and finally a jegde to cover her head (either a pashshayı jegde or a jipek jegde). At the same time the sa'wkele and the kiymeshek had become part of the holiday costume of the newly-wedded bride. During the u'yleniw-toy, the main wedding party, the bride would initially be introduced to the families and their guests in her complete costume, her face concealed by a white cloth or shawl. The face opening ceremony or bet-ashar would then be conducted with the assistance of a storyteller or baxsı at the end of which the face of the bride was finally revealed to the crowd. From a poster published by the Savitsky State Museum of Art, No'kis. The sa'wkele would have been commissioned from a local respected jeweller by a very wealthy father well in advance of the marriage of his eldest daughter. Some reports suggest the sa'wkele became an important part of the bride's dowry and was passed from mother to daughter. However others suggest it was returned to the father for use in further family weddings. After the wedding the newly married bride only wore the sa'wkele for important ceremonial occasions, up to the birth of her first child. However other informants have said that the interval was longer, extending through the first five years of marriage. Clearly in some regions the sa'wkele was once used in combination with the to'belik, while in others the to'belik may have been used as a headdress for unmarried girls. Xojamet Esbergenov believes that to'beliks may have been worn by girls during the period in which they were engaged to be married, thus communicating their non-single status. This likelihood of a dual purpose is reinforced by the nature of the two existing to'beliks themselves. 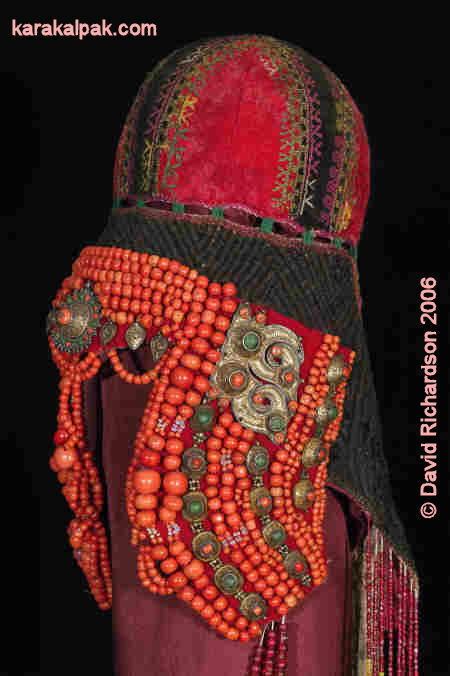 The example from the Hermitage is displayed encasing the tumaq of a sa'wkele while that in the Savitsky Museum seems to be shallower and must be a separate self-contained headdress since it cannot be physically fitted over the top of a sa'wkele.